Candy with a strong coffee-flavored center is popular throughout Asia and Thailand is no exception. In each pack you get 40 individually-packaged candies sealed in a modern, foil, air-tight wrapper. Similar to something you might find at a restaurant for an after-dinner candy treat. 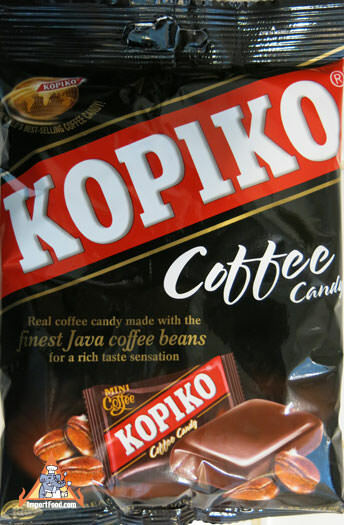 Kopiko is a modern candy-maker with the highest standard of quality, and the flavor is excellent. Ingredients: sugar, glucose, vegetable oil (palm oil or coconut oil), coffee extract, butter, emulsifier (soy lecithin), caramel color, salt, natural coffee flavor. Net weight 120 gm (4.23 oz). Product of Indonesia.